Known also as "Royal Academy of Fine Arts of Saint Fernando", the museum was established by Fernando VI in 1752 and it is located in the spectacular Goyeneche Palace, a finely restored and remodelled Baroque building from the 17th Century. Then it belonged to the local aristocrat Juan de Goyeneche. The museum today houses a rich collection of works of prominent Spanish, Italian and Flemish artists and painters plus many sculptures, etchings, silverware and other valuable objects dating back to the 16th Century. The Academy houses an important museum, reopened in 1986, which contains more than 1,400 paintings, 600 sculptures and 15,000 drawings, as well as an outstanding collection of decorative arts ranging from the 15th century all the way to the present. The most famous exhibits that must be seen include some of the masterpieces of artists like Goya, Rubens, El Greco, Murillo, Velazquez and Ribera. The permanent collection includes masterpieces of Spanish, Italian and Flemish art. Also boasts a great number of temporary exhibitions. Picasso and Dali are former students of this arts academy. 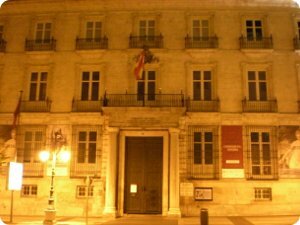 Goya was a member of the Academy from 1780 onwards, and the Museum holds 13 of his paintings. The 20th century is worthy of special attention, since it presents us with the work of modern members of the Academy, thus providing us with a general overview of contemporary art. In this way, all the artistic movements of the 20th century can be followed, from works by Sorolla and Cecilio Plá, the regionalism of Sotomayor, portraits by Vázquez Díaz, and landscapes by Benjamín Palencia and Lozano, through to the modern avant-garde movements. The Museum also has on display an important collection of casts and sculptures that allows us to follow the development of Spanish sculpture from the 17th century until today. The gallery rooms also display fine works purchased through the Guitarte bequest. These include the magnificent Still Life with Lemons by Juan de Zurbarán; part of the collection of drawings by Picasso and many other works of different artists. Tuesday to Saturday: 10:00 to 15:00 h, including public holidays. local holidays (15 May, 9 Nov or 9 Sep). More info about Opening Hours: Click Here. * Line 2 - Sevilla station.